Every day here at La Selva provides our company with a unique challenge, one that we have embraced fully. The grounds that the project is on are filled with so much natural beauty and resources, it would be a shame just to destroy it all by bulldozing the entire thing to reach an end result quicker. Instead, we are incorporating La Selva’s natural beauty into all that we do. The task can be daunting at times, but we feel this will, in the end, only add to the appeal of La Selva, while at the same time conserve much of the island’s natural feel. In this post, you will be able to see the steps that we take each week to remain an Eco-friendly development, one that would rather live within its environment instead of taking it over completely. Some items are small, some large, but to us every little bit helps. Left: The crew members at the water tower standing next to the creek that flows through the garden center and lower villages. Here, in this picture you will see the relocating of plants, hand mixed concrete, re-use of rock on the property and local employees to put it all together. While improving the quality of our roads, we discovered a large amount of sandstone that was being extracted from a nearby construction site. After experimenting with just one truckload, we found that the quality of this stone was great for our roads. By using this stone, we have eliminated the need for processed rock. The product of a crusher, processed rock consumes a large amount of fuel and is very expensive. So now we are essentially reusing someone else's garbage and eliminating unnecessary fuel consumption. From a collapsed home located on the property, we were able to re-use numerous concrete posts to construct an entry gate and watch tower. Each day, plants and trees are relocated in order to make room for improvements. The plants are used along the creek side, and the trees used along the roadside. 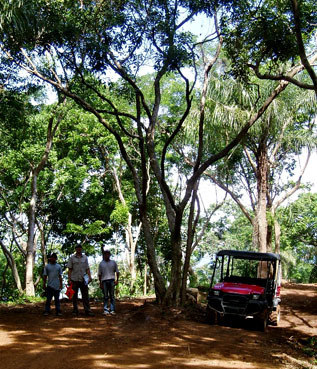 We continually adjust the location of roads, paths, and features to accommodate the plant life of La Selva. You just cannot replace the old growth once it is destroyed, and we would much rather embrace it and work around it. Instead of having concrete trucked in, we have remained a developer that hand mixes its cement. 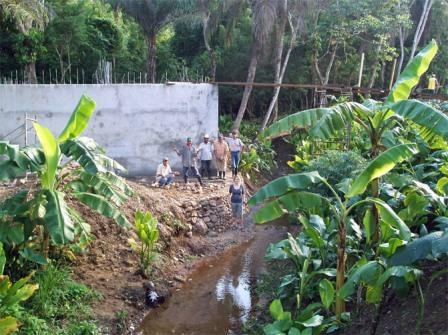 As a result, we use no fuel to produce concrete and provide employment for a number of people. Constantly, we are able to use material that we find on the site. We have been able to use rock found for numerous things. In one case, rock found was used in building water features and culverts. On a separate occasion, rock that we found was used in building the rock pathways that go around the garden center and water tower.